This is the best shaving cream. There. We said it. 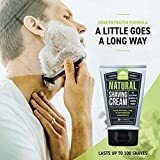 Say goodbye to razor burn, redness, and irritation with Pacific Shaving Company's Natural Shaving Cream. 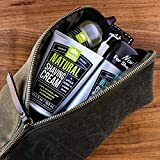 Each batch is free of synthetic fragrances and fortified with aloe and shea butter for a close, yet gentle shave on even the most sensitive of skin. Our vegan recipe is never, ever tested on animals &; good for your skin and good for the earth. A little bit goes a long way with our concentrated formulas in TSA compliant sizes. Nothing is worse than getting your favorite shaving items confiscated at the airport. Our items will help you breeze through airport security. Road warriors rejoice. 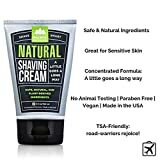 TRAVEL FRIENDLY: Small but mighty, our 3.4 ounce size is carry-on compliant and good for up to 100 shaves. CRUELTY FREE: Pacific Shaving Company's products are never, ever tested on animals. 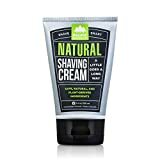 Interested in the Pacific Shaving Company Natural Shaving Cream, 3.4 Ounces, 1 Pack? Is the price too high? You can easily price watch this product and we'll notify you when the price reaches your target.